UFO experts and believers gathered over the weekend for the third international UFO Truth Magazine conference at Holmfirth's Civic Hall. Speakers from Brazil, New Zealand, Canada and the UK shared their latest research and analysis of recent encounters and incidents involving aliens. Holmfirth is a small town in the metropolitan borough of Kirkless in West Yorkshire, England. The two-day conference was held on Sept. 19 and 20. Examiner reports that among the experts is Stanton Friedman, the man who allegedly presented the first proof of the Roswell Incident that it was an ET spacecraft. Government investigation of the 1947 incident said it was a weather balloon that crashed, but Friedman concluded it was a real flying saucer. Friedman is a former nuclear physicist who became a professional UFOlogist. Among the topics and incidents discussed by the speakers were UFOs that flew over 18,000 mph caught on film by military radar, alien spaceships that could turn at 90 degrees while flying thousands of mph as it was pursued by fighter jets, mutilated animal corpses that did not have traces of blood loss and crop circles not set up by hoax makers. According to David Cayton, a former RAF photographer and a UFO researcher, three different militaries have tried but failed to intercept a UFO over Cyprus during the Cold War. The UFO made a 90-degree turn, flew up 60,000 feet and disappeared from the pursuing Hawker Hunter jets of Britain. Gary Heseltine, the conference organizer and MC, and a former detective, told the audience of 200 that UFO believers "were tired of being ridiculed despite compulsive evidence of extra-terrestrial activity. He blamed media for the bad press UFO believers are getting. 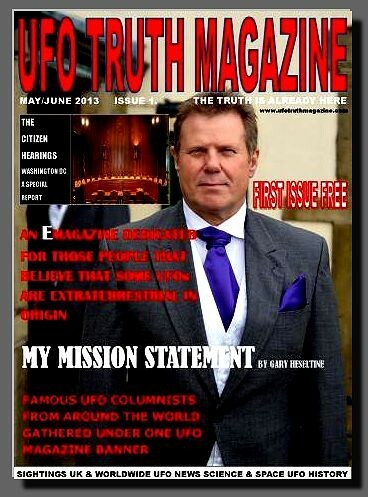 He is the founder of UFO Truth Magazine that he launched in 2013. Is 12-Foot Disc In Volgograd A Large Stone Or UFO?